me: Holy! Look at the size of your jar of mayo! me: Its so huge. Do you really use all that? We barely finish our small jar before the best before date. me: oh yeah, I don’t use mayo in potato salad. sister: What?! What do you do? me: No. I don’t put them in potato salad. me: (frowning) No, I don’t put mayonnaise in cabbage salad! So, what I do do when I make potato salad is dress the cooked potatoes with olive oil and white wine vinegar, sea salt and fresh black pepper, plus maybe some whole grain mustard. Then stir in chickpeas and celery. Or maybe fresh green beans and halved cherry tomatoes. If the weather is cooler, like now, I’ll add cooked beet greens or kale and thin red onion slices. And cabbage salad? 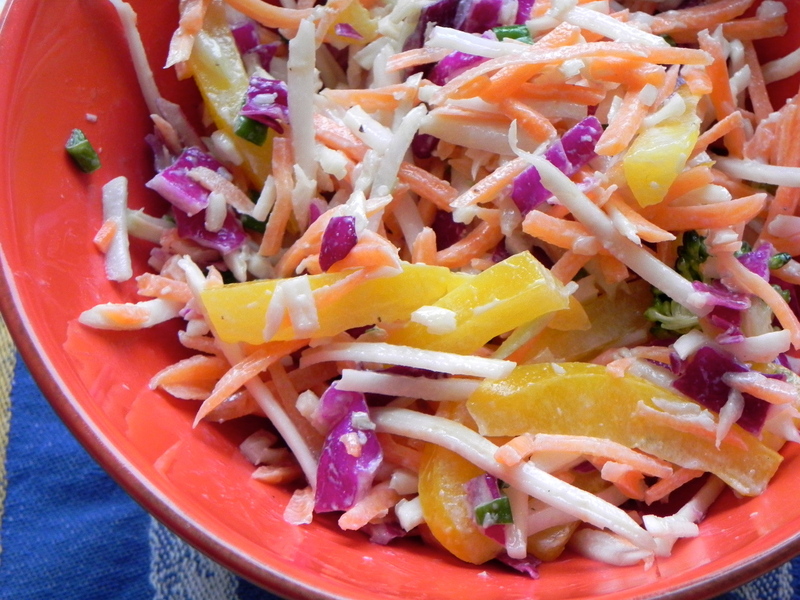 The same dressing base (olive oil and white wine vinegar, sea salt and fresh black pepper) over thinly sliced cabbage (both white and purple), plus some matchstick carrots, sliced green onions, and herbs. Maybe strips of sweet bell pepper. I might substitute some plain yogurt in the dressing. Then I let it sit a few hours to soften the cabbage a bit. I disagree. Mayo is a must for potato salad and coleslaw. A must. Nice photos though. Isn’t it interesting how polarized people are on this? All or nothing when it comes to mayo!